The Svalbard Global Seed Vault is a pretty apocalyptic concept in a pretty apocalyptic place: a lonely repository of almost a million stored seeds of different plant life from around the world, preserved in a building embedded into the Arctic frost on a remote island at the northern tip of the globe. The Vault itself looks apocalyptic. It’s a sharp-edged, vertical rectangle jammed 500 feet into the mountainside on the Norwegian island of Spitsbergen, like the end of a knife handle plunged into a frozen side of beef. It looks exactly like a set from a big-budget Hollywood end-of-the-world disaster movie, in which a rugged and diverse band of far-sighted, parka-wearing scientists must go to the ends of the Earth in a race against time to save the world while evildoers or religious fanatics try to thwart them. Located just 800 miles from the North Pole, the Svalbard Global Seed Vault is designed to preserve global botanical diversity against the threat of absolute catastrophe — be it nuclear holocaust, meteor strikes, crippling volcanic eruptions, or mass disease that wipes out the world’s plant life. The Vault commenced operations in 2008, and it contains more than 850,000 seed samples, from nations all over the world, that could be used to restart plant life after the post-disaster dust has settled. And now the first withdrawal from the Seed Vault is going to be made — thanks to the Syrian civil war. The Seed Vault contains samples of hardy strains of wheat, barley and grasses that can grow in desert areas, and those seeds have been requested to replace seeds in another seed bank, in Syria, that has been damaged by the fighting. 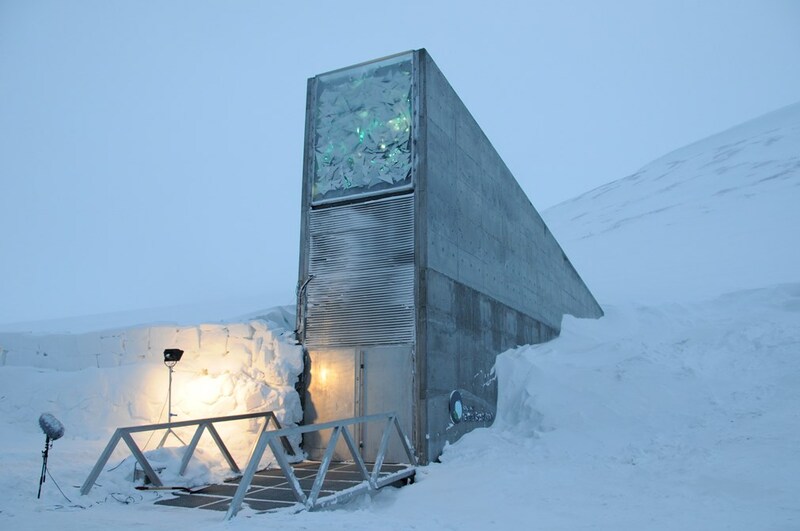 There are a number of seed banks located around the world, but the Svalbard facility — thanks to its remote location and frozen climate — is considered the ultimate backstop. It’s sad to think that, only a few years after the doomsday vault was opened to store seeds for eternity, a mini-apocalypse has required it to be used. And you also wonder: at what point do the Seed Vault’s operators stop allowing seeds to be removed? Crippling and destructive civil wars in places like Syria are terrible and devastating, but they are also — unfortunately — commonplace in our war-torn world. If your purpose is to safeguard the global ecology and preserve a glimmer of hope for the world in the event of the unthinkable, a miserly withdrawal policy would seem to be in order. Scientists in Siberia have discovered and grown ancient fruit — thanks to some Arctic ground squirrels that lived thousands of years before the end of the last Ice Age. The squirrels had stashed the fruit in their burrows dug deep into the permafrost. The fruit quickly froze and has remained frozen for 30,000 years. The squirrel burrows were left undisturbed and were apparently discovered by people looking for the remains of mammoths and other Ice Age creatures. Scientists took the frozen fruit and, using advanced techniques, have been able to grow plants from the fruit remains — making the fruit, from a plant called Silene Stenophylla, by far the oldest plant material brought back to life after an extended period of dormancy. The discovery gives scientists hope that they might be able to find, and revive, the frozen remains of extinct Arctic region plants. Who knows what happened to the squirrels that originally stashed the fruit? Perhaps they were eaten by a stray saber-tooth tiger or some other Ice Age predator. But their pack-rat storage habits have allowed scientists to bring an ancient plant back to life — and have given new meaning to the notion of squirreling things away.